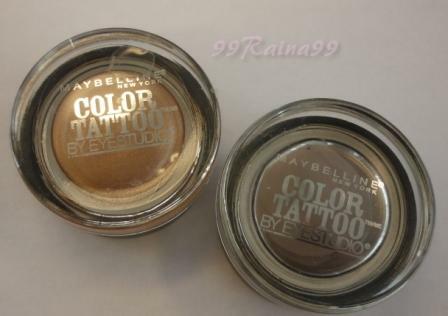 So I mentioned last week, in my Painted Purple post, that I picked up some more Maybelline Colour Tattoos 24hr Eyeshadows. I grabbed Bad to the Bronze and Tough as Taupe. 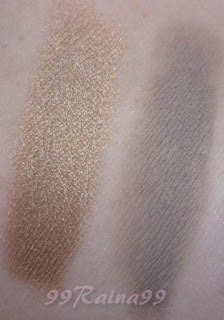 Bad to the Bronze is exactly how I would picture a bronze eyeshadow to be. This is what a goddess wears LOL ! It is creee-ammmyy. It transfers awesomely. And I can’t say how much I love the little gold flecks that run throughout. It is luxe! Tough as Taupe is a great base. I have to say I have been using this in place of my MAC Painterly paint pot. :O I like how it is creamy yet has a matte appearance. You can layer it up to build up intensity. So easy to work with. I find using a sponge applicator makes it so easy to apply a smooth even layer of colour. I also use my ring finger to blend out the outer edges. And If I am so inclined, I will layer a complimenting shadow over top. It gives the powder eyeshadow a boost. If you love taupes, GO GET THIS! 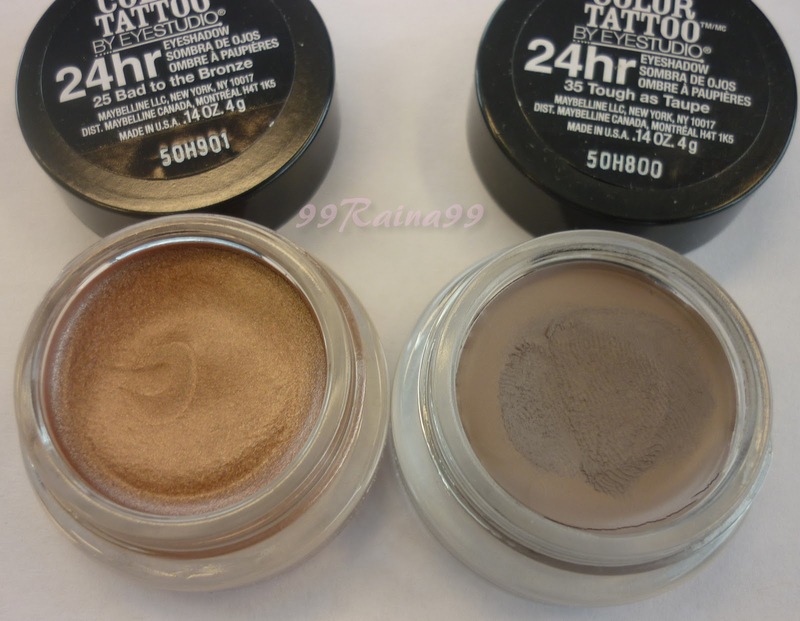 The staying power for these colour tattoos is amazing for a cream shadow. I swatched these on my arm at 10 AM and it is 9 PM now and they are still there. The intensity faded a bit, not a lot, but enough so I noticed. But how often does one wear eyeshadow on their arm? LOL They do fade faster on the eyelids. Probably from the oils. I noticed mine began to fade a bit around the 6hr mark. But I have been touching my eyes a lot lately. I have a stinkin’ headcold. Booo!!! But to make the colour tattoos really last I would use an eye primer. I didn’t notice any discernible creasing with these two shadows. Would I buy again? Hell yeah. I wonder how these will hold up after a few months. I hope they do not dry out. It is probably best to get these at Walmart/Target /CVS. I noticed the drugstores jacked up the price by $3-$4. I got these guys at Walmart for $6.97 CDN. Shoppers Drug Mart have them for $9.99 CDN :O. Crazy how much cheaper they are eh?? I have Bad to the Bronze and Audacious Asphalt and the wear time on these guys really blew me away! I was able to get through a 9 hour work day without any creasing. It was pretty impressive. I have renewed faith in cream shadows because of these bad boys! Bad to the Bronze is my goto base colour now. Great for neutral looks or by itself. I have actually been using Painted Purple as a eyeliner for a pop of colour. They do last a long time and apply so easily! I don't even look at Benefit cream eyeshadows anymore. I used to drool over them when I hit up Shoppers LOL.